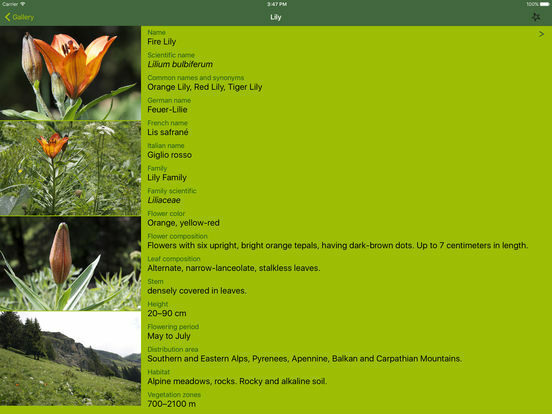 AlpineFlower Finder - THE Swiss App to easily identify the most beautiful alpine flowers from Central Europe. Your invaluable guide for all your walks and hikes. No internet connection needed! - NO INTERNET CONNECTION required! - EASY IDENTIFYING flowers by color and their characteristics, single or in combination. 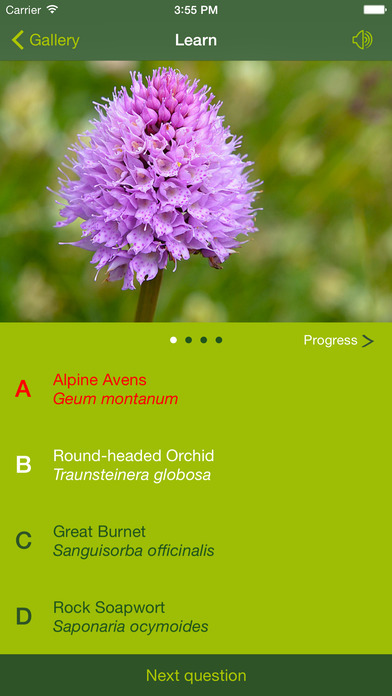 - A FUNNY and EDUCATIONAL way to learn the names of alpine flowers: the built-in educational game teaches you the botanical and English flower names. - Adding FIELD DATA, notes and pictures during your hikes and create your very own list of favorites. 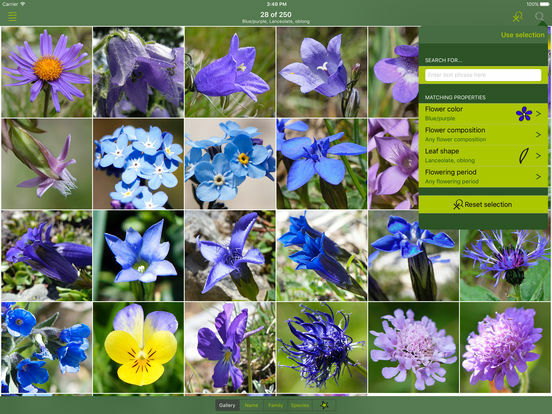 - INVORMATIVE: The app provides you with the flower’s name in English, French, German and scientific, the most important botanical data and information about flowering period, location and habitat, and a brief description. - CLEARLY ARRANGED: The flower-catalog can be sorted by name, family or genus. Some media coverage: September 2015 on radio 'sf 4 news' and 'SWR 4 Baden-Württenberg'. June 2015, Swiss Board-Magazin 'Apps to have'. Magazine Schweizer Garten, Alpine flower portraits. August 2014, Portrait of Renata Caviglia's AlpineFlower Finder in 'Zentralschweiz am Sonntag'. Alpine flowers - They are everywhere, on the way to our most famouse glaciers and mountains. So who are these beauties? 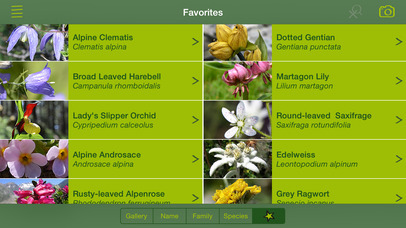 You can easily find out with Alpineflower Finder. IDENTIFYING AND FINDING FLOWERS IS EASY! The flowers can be searched by: flower colour, flower composition, leaf shape and/or flowering period - or by text searching. Our catalogue can be sorted alphabetically by either name, family or genus. 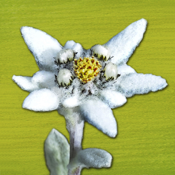 EDUCATIONAL GAME – to learn easily the english and scientific names of the alpine flowers! 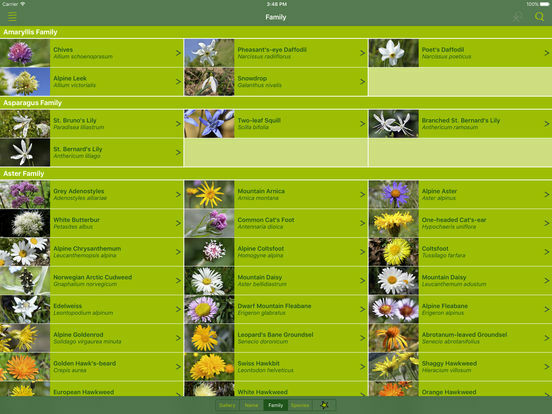 AlpineFlower Finder allows the user to create their very own list of favorites, adding notes and pictures. The list can also be complemented by adding photos of flowers taken directly during the mountain walks. We welcome your questions, thoughts and suggestions. Please contact us! 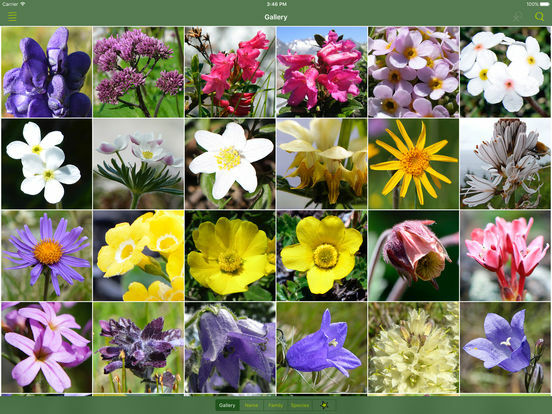 Version 4.1.0 contains 250 alpine flower portraits and over 1'000 full screen pictures.